Home | Blog|About Us| My Account | Help |Gift Certificate | New Products!| On Sale! Deal of the Day Tools & Machinery Jewellery Kits Findings & Metals Displays & Packaging Beading & Wire Wrapping Inventory Clearance! This unique precision-made steel vise adjusts for tilt and rotation on two axes, providing optimum comfort and efficiency. Jaws open to 1.8" and are 2.3" wide by 1.6" tall. Plate and adapter sold separately. 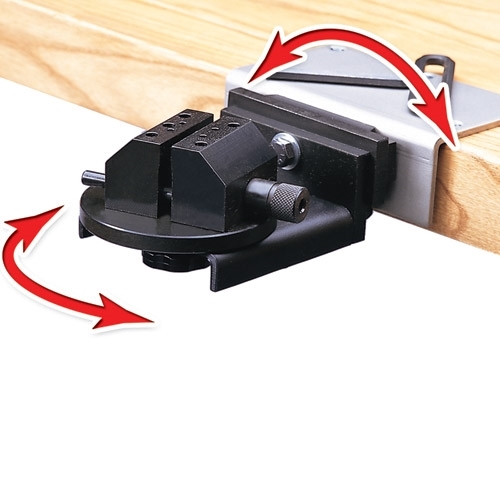 Uses the versatile "lift on/lift off" BenchMate mounting system. You can adjust it to any angle because it tilts and rotates on two axes. So your work adjusts to you, adding comfort and efficiency to your bench setup. Uses the same attachments as the GRS engraving block, the Multi-Purpose Vise solves dozens of holding problems. Precision-made from steel for rugged dependability. Includes vise assembly and wrench. Fits any BenchMate Fixed Mounting Plate (not included). Add the 520 Attachment Set for Multi-Purpose Vise to solve even more workholding problems.